Attention: All Community Information and Referral providers, data providers and partners throughout Ontario (and beyond). This is your opportunity to celebrate your success stories and raise public awareness of the critical and rigorous work of I&R organizations – both big and small. We know that every day thousands of people find the help they need quickly, conveniently, and free of charge because of Information and Referral (I&R) services throughout Ontario. To celebrate the work of our sector, InformOntario and its members and partners are celebrating the work they do on November 16th - I&R Day! Here are some ways to celebrate --- big or small --- your important role in your community. Use the I&R Day logo on press releases, promo materials, buttons, etc. November 16th was declared I&R Day in the U.S. at the request of AIRS, the Alliance of Information and Referral Systems, an international non-profit professional association of individual, public and private I&R organizational members. InformOntario wants to bring its own flavour to the day by supporting its members. 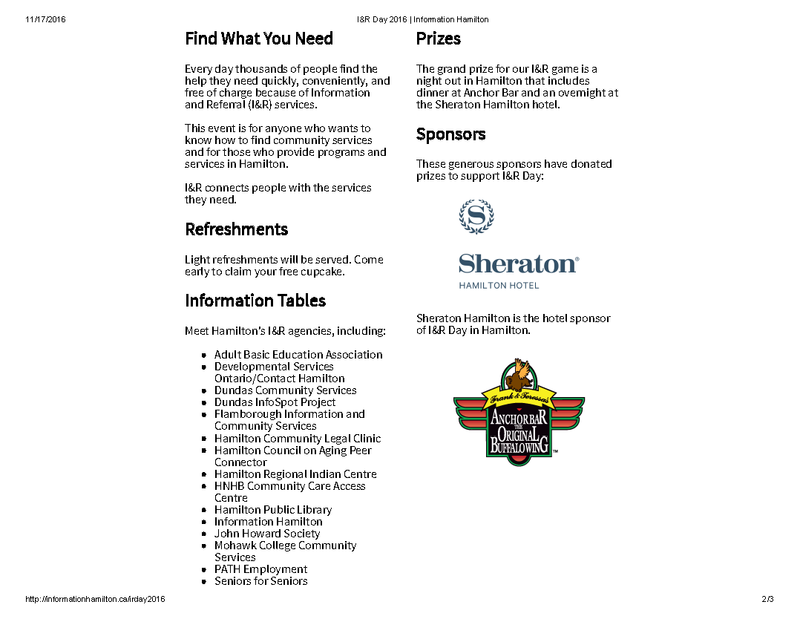 Below are some tools and materials to help your agency quickly create an event for I&R Day. Our guest speaker, Harriet Ekperigin, will speak about BIG WHITE WALL, an online mental health resource that provides peer-to-peer support. Our panel of front line professionals will discuss their experiences working in I & R, and how the job continues to evolve. A panel discussion with front line I & R and system navigation professionals from various areas in the health and community care arenas. Lunch n' Learn Panel Discussion about the value of the profession, challenges and successes; will have 40 in attendance, media promotion (and cake!). 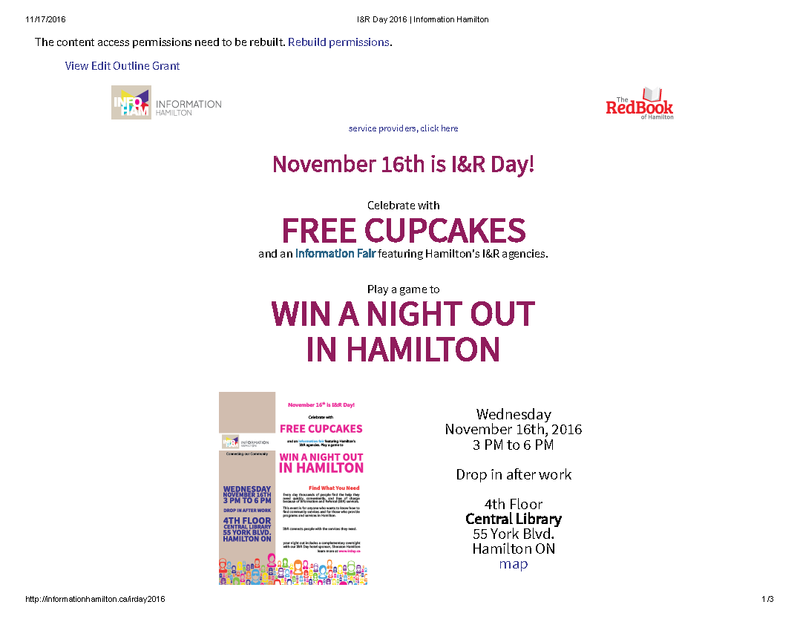 Our thanks to Information Hamilton and PIN for sharing their planning and event materials. Let’s spread the word and share the results. 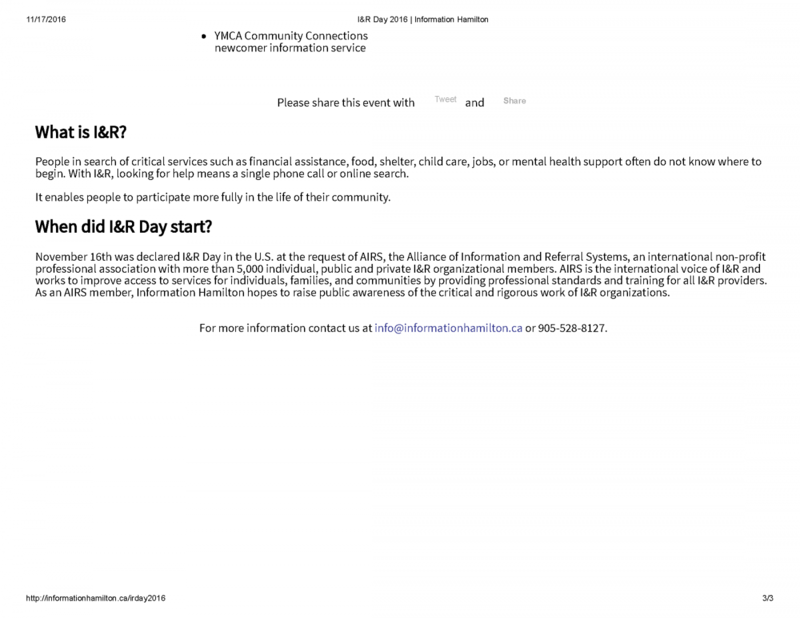 Planning to do an I&R Day activity? We will contact everyone after the event to gather feedback, more resource tools, etc.